Homepage. 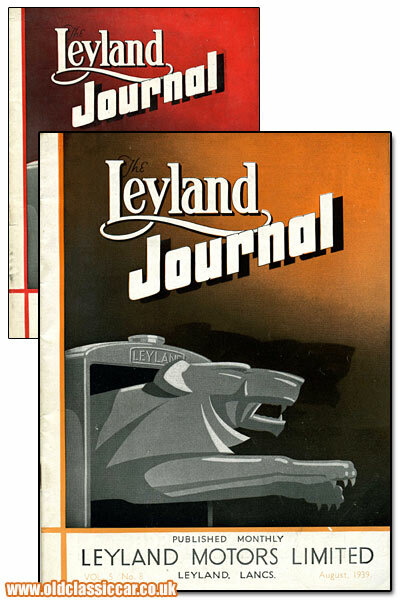 This page: Two copies of The Leyland Journal, from 1939 and 1946. In the 1940s and 1950s, nearly all the lorries to be seen on Britain's roads would have been of British manufacture. A flick through a commercial vehicle magazine in the local newsagent, The Commercial Motor being one of the most popular, would have been packed with adverts for British-built lorries, and lorry bodies. Leyland lorries (not "trucks"!) were one of the most popular types seen pounding up and down the 'A' roads of the UK, in a market filled with once-common names such as Foden, ERF, Seddon, Atkinson, Fordson, Bedford and Scammell, to name just a few. The covers from two of their magazines are presented alongside, one from immediately before WW2, and the second shortly after the war had ended, when the country was desperately trying to get back on it's feet, something that would be a long time coming. The August 1939 issue was labelled as 'Vol.5 No.8' and the March 1946 issue as 'Vol.6 No.1' which suggests that no magazines were produced for the duration of the war. Interestingly, the cover of the 1939 issue suggests a monthly title, whereas post-war it became bi-monthly. Unlike the post-war copy, the pre-war issue of this in-house Leyland magazine features several pages of advertisements, for products relating to commercial vehicles, and it is this issue that is looked at here in detail. Adverts for lighting and manoeuvring equipment to suit trolley buses (C.A.V. Bosch), and anchor clips to fit on a lorry's leaf springs (by Samuel Fox & Co. Ltd) occupy the first two pages, with further ads for Thompson Brothers (builders of tanker bodies) and Lockheed brake fluid to be found on pages three and four. Shown above, an example of a Thompson Brothers' (Bilston) Limited motor spirit tanker body, in the livery of Regent Fuels. With a capacity of 2,500 gallons, and of elliptical design, it is shown fitted to a contemporary Leyland lorry chassis. Further adverts for Clayton Dewandre (vacuum brake servos), Essolube Motor Oil (part of the Anglo-American Oil Company), Delco ignition systems, Carrimore Trailers, Duramin drop-sided truck bodies, Brico piston rings, Sternol Lubricants, Triplex glass, Girling Brakes, and Shell all follow, before the magazine's proper content starts. Two very smart tankers built by Butterfields of Shipley are also advertised, and are shown below. I wonder how happy the top brass at Leyland were with an advert in their magazine featuring a rival Bedford?? As the magazine was aimed squarely at operators of Leyland lorries, or those thinking to buy a Leyland, most of the articles are of a business-type. The first discusses how the Income Tax Act of 1918 affects haulage operators in Britain, with notes on how the company owner might employ members of his/her own family, and notes on how to wind up a business. Of more interest is a small article featuring a diesel-engined Leyland Tigress, that had recently been sold to Canadian National Transportation Ltd. The author comments on how vehicles of this size in America had three small green lights fitted to the forward end of the roof, and explains why this is. They were compulsory fitment to all such coaches and buses in the Province of Ontario, and also New York State. They signified to oncoming traffic that the vehicle was a 'heavy', rather than a private automobile. Handy things to have at night, when judging the scale of an oncoming vehicle can be tricky. Are these still a legal requirement over there? As the vehicle was used for trips to New York, it had also been fitted with a transmission brake (operated by the handbrake lever) and front/rear turn signals, both demanded by that State's legislation. Twenty Nine seats were fitted. The centre pages of the Journal show a number of Leylands recently supplied to their new owners, again showing the Canada-bound Tigress, along with a Leyland Lynx DZ1 supplied to wholesale food distributors J.F. Percival Ltd, a flatbed Leyland Octopus - one of two TEW14T models supplied to Great Northern Transport Co. Ltd. of Ellesmere Port, a Leyland Tiger coach fitted with Harrington coachwork destined for Southdown Motor Services Limited, a Leyland fire engine for use with Hastings' newly-formed fire brigade, a Lynx DZ3 van destined for the Police Department in Larnarkshire, and another DZ3 Lynx with dropside body by The Arlington Motor Co. sold to H. Hickman and Son Ltd.
Wartime preparations within the haulage industry. Although the war for Britain hadn't yet started, preparations across the country were well in-hand by this time, as things were looking decidedly shaky across the Channel. The 1939 issue of The Leyland Journal includes a very interesting article about businesses, and the requirement for organisations with more than fifty personnel working in their premises, in certain areas, to provide air-raid shelters to their employees. The arrangements made by East Yorkshire Motor Services are featured, as is the 50 person above-ground shelter that had been provided for the firm's employees. Specific air-raid precautions for business owners were laid out in a pamphlet entitled "A.R.P. in Industry". The estimated cost for providing suitable shelters was around the 4 GBP per employee mark, although a grant from central Government was available to help with these costs. East Yorkshire Motor Services Limited were one of the first in the transport industry to erect such shelters, with their first fully completed air-raid shelter being built at their premises at Anlaby Common, Hull. Wherever possible shelters would be built underground, but there were issues with the local water table which meant the one shown had to be built on the surface. The building, designed to accomodate fifty people, consisted of a steel tunnel and a concrete floor, covered over entirely by 3ft-4ft of earth, and revetted with 16 gauge corrugated sheeting to keep the earth in place, and at the same time maintain a smart appearance (!). An estimated 150 ton of earth would be required, held in place with (creosoted) wooden A frames. The frame surrounding the shelter's entrance must be painted with luminous paint, in order that it could be located during hours of darkness - perhaps black-out regulations were already being thought about by this time. Internal lighting would be provided by independent batteries, with a series of hurricane lamps providing a back-up. Side benches were included, as were various pieces of equipment such as shovels, crowbars, first aid kit, sand buckets and fire extinguishers, in case things got fraught during a bombing raid. Various news items relating to the road haulage industry fill the remaining pages of the magazine, along with a further selection of adverts, including one for Rubbolite lamps, shown below. One interesting final snippet concerned a driver found drunk at the wheel of his broken-down lorry. The local magistrates decided that a lorry unable to move due to engine troubles, which could not be cured by temporary repairs, was not at that time a mechanically propelled vehicle. With this in mind, they threw out a case made against a driver who'd been found to be under the influence, presumably slumped behind the wheel of his lorry, waiting for the repair boys to show up.